Prefabricated homes seem to be getting more popular by every single month that passes. This happens as people start to look for affordable, smaller scale housing. Prefab homes fit the bill. Some time ago, most people saw prefab homes as really hard to sell and low-quality, but this did change. In part, this is due to the fact that manufacturers are a lot better than in the past. The prefab homes of modern times are so much better than what people expect. Many can be really stylish and very sturdy. Just as with everything in life, before you make a decision, you need to know advantages and disadvantages. This is also the case with prefab homes. Obviously, most manufacturers will just focus on the advantages of prefab homes. We will tell you that and highlight some drawbacks that you should take into account before a purchase. The truth is that a personalized, really lengthy building process is not for every person out there. With prefab homes you can avoid this, giving you quite an affordable way to become a homeowner. Also, you gain access to the following advantages. The prefab homebuilders buy in bulk much more than traditional homebuilders. This allows them to accurately predict most building costs while saving money. Cost savings are passed to clients, the new homeowners. A prefab home is normally sold based on a per square foot price. Based on size, you know exactly how much you are going to pay. In many cases, building price is around 50% or lower than with traditional building. Prefab does keep mortgage costs low. If you are on a tight building schedule, you will appreciate what prefab homes offer. Builders know everything about how to put everything together when the schedule is tight. A home is practically brought to the lot already built. Its “shell” is usually ready in just one day. With a traditional build you can wait any period between three and twelve months. Traditionally built homes are not wonderful when it comes to protecting the environment. Every single day there can be materials that are bought to the site so carbon emissions are always high. Also, so many materials end up wasted. When you want to be environmentally friendly and are interested in sustainability, the prefab home is something you have to consider. Prefab builders know how much material is needed and if there are extras that appear, they will be used on another prefab home, for another client. Shipping costs are minimized since just one trip is needed to ship the entire home. Carbon emissions are drastically reduced. Also, many manufacturers are now specialized in designing energy efficient homes, with highly efficient windows and additions like solar panels. You can thus save money on utilities. 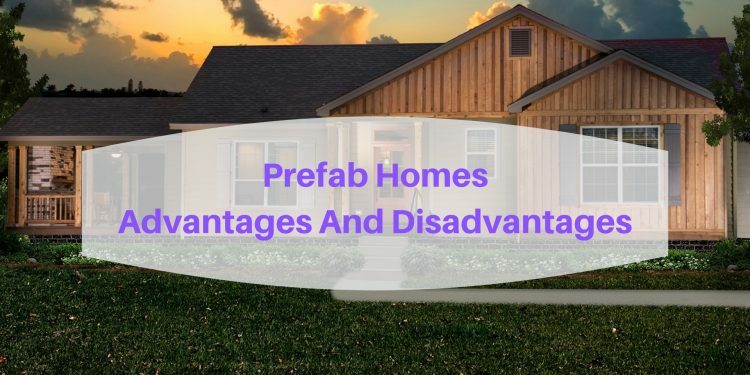 Although sustainability and low price are two great reasons why you may want to consider a prefab home, you should also think about the disadvantages that appear with such an investment. As a homeowner, you might be faced with more work than you initially think. With the traditional building projects, the contractor or the builder is responsible for logistics. With prefab homes, you might be responsible of organizing hookups for utilities, checking zoning and even finding suitable lots. Prefab builders just build the home and then deliver it to your lot. Many extra details are up to you. There are many cities where prefab homes are actually really difficult to build. There are zoning issues and land covenants that could easily limit placement options. For instance, in some cities there are home size codes and in others there are limits put on building materials or used finishes. It is really important that you research city codes before you commit to prefab home buying. This is, for most people, the biggest disadvantage of buying a prefab home. With such an option you can make choices like favorite flooring and tiles used. However, some of the materials are already chosen for you and the general size and layout of a home tend to be limited. We have to understand that the prefab home builders keep those costs low by simply building the exact same structures over and over. It is normally not a problem to make some cosmetic customizations but size and structural choices do not really exist. A catalog is presented and you choose the home, then maybe add a cosmetic stamp. This is about it. It is impossible to deny the fact that prefab homes are highly advantageous for numerous interested buyers. However, this does not mean you should blindly make the choice simply because everything is simpler and you can finally own a home. You need to consider every single angle and make the choice only when you feel that the drawbacks are not that important for you.